Nothing is better than a tall glass of lemonade on a hot summer day. Lemonade is one of my favorite things to drink. I love strawberry lemonade the most, maybe because it's pink? When we use to live in California, we had a friend who had a lemon tree. They would give us bags of lemons and I would make homemade lemonade all the time just to use up the lemons. Today is National Lemonade Day, in case you didn't know. The lemon cookie cutter is from here. For the lemon cookies, I used two shades of yellow icing and white. I used lemon yellow Americolor gel paste to achieve the primary yellow icing. To get the darker yellow, I just added a bit of egg yellow to primary yellow icing. I piped and flooded the lemon with the primary yellow. While the icing was still wet, I added the white dots at the top and the darker yellow shadow line along the bottom of the cookie. For the lemon slices, I used a small circle cutter but these cutters are available at PlasticsinPrint to make decorating much easier. I started out by piping two yellow circles that would be the lemon rind. I filled that small section in with yellow icing and allowed it to dry for an hour. Then I filled the middle section in with white icing. Again I allowed that to dry. Once completely dry, I took a yellow food color marker and drew on the lemon sections. I took the primary yellow icing and piped over the sections I just drew. I filled in each section and allowed the cookies to dry. The mason jar is from here. I used a light blue icing to outline the entire cookie. I used a yellow food coloring marker to draw line for the lemonade and the ice cubes. I piped and filled in the ice cubes with white icing. I made a lighter yellow icing by mixing the primary yellow with some more white icing. Once the ice cubes were dry, I took the lighter yellow icing and filled in the lemonade part of the mason jar. When the yellow was completely dry, I filled in the remaining part of the jar with the light blue. The final touches were adding some blues lines on the neck of the jar and along the edge as a highlight. The pitcher was cut from my Silhouette because I don't have a pitcher cutter. This is the shape I used. For decorating the pitcher, I followed the same steps as the mason jar. I did add a lemon slice in the pitcher. I did that first along with the ice cubes, following the same process as the big lemon slices rind- middle- sections. While searching for a pitcher, I saw this lemonade stand. I just cut out the awning part of the lemonade stand with my Silhouette. I traced the awning shape on the cookies and drew out the rest of the lemonade stand. I started icing at the top with blue section then the yellow. I allowed that to dry, then created the brown awning supports and the large square for the stand. Once those sections dried, I piped another brown rectangle which would be the counter top part of the stand. The final touches were adding the green bunting and lemonade sign. The plaque cutter used for the chalkboard cookie is from PlasticinPrint again, it can be found here. I piped and flooded the cookie with black icing, allowing it to dry over night. The next day I took a seldom used makeup sponge and white food coloring to create the chalkboard effect. I just dabbed and smearing the white food coloring on along the edges. I let that dry for an half an hour. Then I came back with a small paint brush and free-hand painted the words, the little flower and the lemon. The word "lemonade" went a bit downhill but, overall I'm happy with how it turned out. I brought these cookies home with me to Minnesota for my family to enjoy. 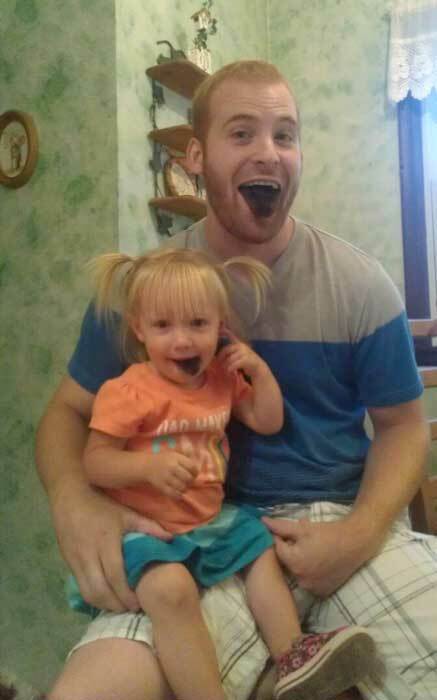 Here is my niece and sister's boyfriend after they had shared the chalkboard cookie. Enjoy a lemonade today with someone you love.